Pieced Brain: 10th Anniversary as a Quilter! 10th Anniversary as a Quilter! It's celebration month! 10 years ago this month I decided to learn how to quilt. I walked into the local quilt store, bought a book about log cabins by Eleanor Burns, read it cover to cover 6 times, and made 12 log cabin quilts in a row amidst a busy life as business owner, with two little busy boys, and not a whole lot of sleep. This is another reason why I am so glad I started this blog three years ago because I get to take pictures of what I make and share them with you. I realize I have a very eclectic taste, which allows me to learn and try very different techniques. I have since begun to design my own patterns and a whole new way of enjoying this craft has flourished (click here and here for the published ones, and here for the Etsy Store. More patterns to be added soon to the store). This year I am having a lot of fun designing the blocks for the City Girl Sew Along. More new projects and tutorials are lined up for the next few months. To celebrate my love of quilting I will have giveaways this month. The first one starts today with a $25 gift certificate donated by Fat Quarter Shop to a random reader who answers this question: For how long have you been quilting? You do not have to do anything fancy. Just leave a comment (leave another one to tell me you follow my blog for an extra chance to win), and if you are a no-reply blogger, make sure to leave your email address (you can write it like this so you won't get spam emails: mary(at)everywhere(dot)com). The giveaway ends this Friday, May 8, at 5pm, and the winner will be announced on Monday, May 11. I will be spending this day going through my current projects and deciding which one I will finish. I hope you will be having a fun day, too! Congratulations on 10 years! It's always great to see how people started out and the early quilts they made! Congrats! I began quilting less than 3 years ago (and I'm SO addicted). My first quilt I made was when I was a sophomore in college...waaay back in 1981! It was a simple block quilt in shades of purple and covered my full size bed. I still have it and use it on picnics, ball games, the beach or snuggling under when in the hammock. I've just recently gotten back into quilting and want to learn more techniques and blocks. I am a Pieced Brain follower on Bloglovin! Congrats on the Big 1-0! I've been quilting for most of my adult life, but only seriously for the past 16 years. Congratulations! I'm 11 days off 11 years with my husband so we're celebrating together this month! I started sewing in 4-H 34 years ago but I didn't really begin quilting until about 9 or 10 years ago. Happy anniversary. I've been quilting 20 years and what fun it's been. I follow your blog by email. Congrats on your anniversary. My first quilts were for dolls and 4-H projects, but I never quilted my own until three years ago - I had always tied my quilts before that. I've been quilting since 1980! Congrats. I have been quilting on and off for about 20 years. My first quilt was a log cabin also. I have been quilting for approx. 5 yrs now. Just started last year with a class at my local quilt shop! I have been quilting since 1994. I took a beginner's class just to learn about the basics of quilting and practicing a lot before I decided to make a black, white and gray cat quilt. I took a lst place ribbon at our Fairgrounds and cried when I saw the ribbon on my quilt. Anyways, congrats to you and bless your little heart for being so generous with all of us. I have enjoyed your blog and have been looking forward each month for the City Girl Sew Along. Happy 10th Anniversary to you! I have been quilting since 1987, which I make my son a quilt and handquilted it while pregnant with my second child - 14 years difference between the two:). My first quilt project was when I was just 13. I have gotten away from it for years now and would love to begin again. I made my first quilt project in 1986 - 29 years ago, but didn't get serious about it until 1991. My first project were floor pillows quilt as you go - kissing dinosaurs I think. Don't know that I can ever stop. Congrats on your 10th year! I follow your blog on Bloglovin' and Pinterest. Happy Anniversary! I've been quilting for 6 1/2 years. I decided to take a quilting class at the local community college the year out youngest daughter graduated from our homeschool. I learned to make a quilt completely by hand and the next year I learned how to make a quilt with a sewing machine. I haven't looked back and I can't wait to see what I will learn in the next 6 years. Congratulations on 10 years of quilting. We should be giving you presents for all the good things you do. I follow Pieced Brain with Bloglovin. Great blog. I follow your blog via email. Thanks for the chance! I've been quilting off and on for about 13 years. Congrats on your anniversary! Congrats! II just started quilting this year. Thanks for a chance to win. I've been piecing for about 4 years. I've always sewed and made lots of whole cloth quilts which I tied. I love piecing and machine quilting. Congrats on your anniversary and thanks. I follow with email. Thanks. Congratulations! I have been quilting for about 30 years! I started quilting in 2008, just making small stuff at first to build up my skills. Congratulations on 10 years of quilting! Congratulations on 10 years. I'm little more then that. I started my first two quilts about 35 years ago, and didn't finish either one. They had such dated colors and prints! The first finished quilt was about 25 years ago. Happy Anniversary of quilting!!!! I think I have been quilting about 25 + years. I watched Georgia Bonesteel on tv and just had to make one so did:) Of course I started with a kit that had all the techniques in one... ugh!!! Still have it in the bottom of a trunk somewhere. Always smile when I come across it:) Oh what I have learned since then!!!! Congratulations on your quiltaversary! I've been quilting for 45 years or so....but not consistently. Years on.....years off....but have been steadily quilting this past 10 years. Thanks for the giveaway! I happily follow you on Bloglovin! It's always interesting to discover how people started quilting!! For me it was a trip to the east coast (NS, NB, PEI)! Thanks for the chance!! I follow you via Bloglovin!! I made my first quilt 30 years ago, but really started quilting in earnest about six years ago as part of my "retirement"
Cheers for anniversaries. I started quilting in the 70s but took a 20 year break in there somewhere. and I do follow your blog. I think the google ID gets to my addy, but just in cse . . .
Congratulations on 10 years, Denise. It's a great milestone. Here's wishing you many more decades of great quilting. Thanks so much for inviting us to celebrate with you and generously giving the gifts. I've been sewing for about 8/9 years but still a fledgling quilter - haven't done what I would call a "proper" quilt yet (as in batting, quilting and binding) but I'm working on my first one :) Congratulations on your anniversary! Congrats! Isn't quilting and blogging fun! I have been quilting since 1999 and blogging since 2008. I started quilting 31 years ago! I follow your blog and enjoy it! I began quilting in September 2011. You won't believe this, but the first quilting tool I got was a midarm quilting machine. I just kind of fell into my lap, and presto I became a quilter. Thank you so much for sharing and congrats! I made my first two quilts last year! Congrats to you! My hubby bought my sewing machine about three years ago because I wanted to start quilting and I am just now getting it out and starting to put it all together. So I have been quilting for just a few months. Happy quiltaversary! I'm a self-taught quilter of 21 yrs. At the time I was pg with my first baby, and had a lot of time on my hands. And my baby needed a quilt. I so wish I had learned at my Grandma's knee. She quilted till she was well into her 80s :) Thanks for the great giveaway. I've been quilting for about 15 years and now I get to sew with Eleanor Burns once a month! She's the reason I quilt as I watched Quilt in a Day every week and finally gave it a go. Happy 10th Year Quiltyversary!!! giggle It is such a Fun time isn't it! Yay! I follow you via email. thanks for the City Girl blocks! I follow you thru email and bloglovin too. My other comment disappeared, so I'll try again. I have dabbled in quilting for over 23 yrs. when our oldest son turned one. Wow, 10 years of quilting - a great milestone! I count my quilting start from the time I joined a bee - since I figured out what I was doing wrong and how to do it right with the help of some patient and caring women! That was about 7 years ago. It took me many years to finish my first quilt, but I have come a long way and have finished several just last year. Hopefully, this year will be even better! Congratulations on 10 years! I have been quilting for about 7 years now - and still learning. Thanks! I started quilting 12 years ago. Yay! I am a follower with bloglovin'. Congrats to your milestone and many more to come! Since the mid 1970's is when I first stated quilting. Everything was done by hand then! Happy Anniversary Denise. I have been a follower of yours for a long time now. Congrats on reaching this milestone!!!! I get your posts via email! Thank you!!! Happy 10 years! wow! thank you! I get your posts by email! thank you again! I first took a class in 1982 that was all hand quilting. 33 years later I am quilting more than ever. Congratulations on 10 years! I've been quilting for half my life, 25 years. Pretty quilts you made! Congratulations on your 10 years of blogging and sewing. I follow you by email. Thanks for the opportunity to win your giveaway. I wish I had photographed my early quilts, but without a blog I never thought about it!!!! I started quilting in the late 60s!!!! Yikes. Congrats on 10 years! I've been quilting for a couple of years. Congratulations! I've only been quilting for 3 years. I probably never would've taken the plunge except for the great online tutorials and online quilting community. Thanks! Congratulations on ten years of creativity. I started quilting at age four for my dolls but the first bed cover was made fifty three years ago out of necessity for life in an unheated apartment. I didn't start taking pictures and keeping a quilt diary until about 30 years ago. (even then, sometimes I gave them away before I remembered to take a picture) Blogging? That was my son's doing... he scanned my paper diary. Isn't it great to meet other quilters this way and share all kinds of stuff ? Inspiration and friendship re at the top of the list. I started quilting 8 years ago & love it. Thanks. Happy 10 years!!! I've been quilting for 2 1/2 yrs!! Thank you!!! Congratulations! i love quilting...but now it's gardening season, so my latest project will have to wait til a rainy day! I follow your blog via your email newsletter. I am a follower!!! I am getting busy with yard work now, but the quilting never stops!!! I`ve been quilting about 3 years. It`s nice you describe yourself as an eclectic quilter. I like that! I'm not sure exactly how long I've been quilting, but it's over 15 years. It's fun to look back on how our personal styles and even styles in general have changed over the years. I have been REALLY quilting since 2011. I had dipped my toes into quilting years earlier, but didn't really have to time until I retired. Thanks for the chance to win! 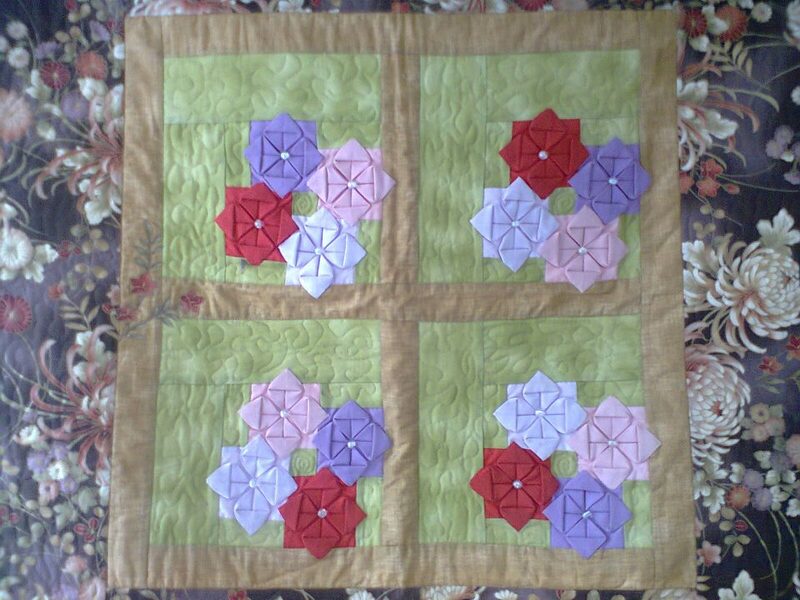 I made two quilts back in the 90s, but rediscovered the fun four years ago. 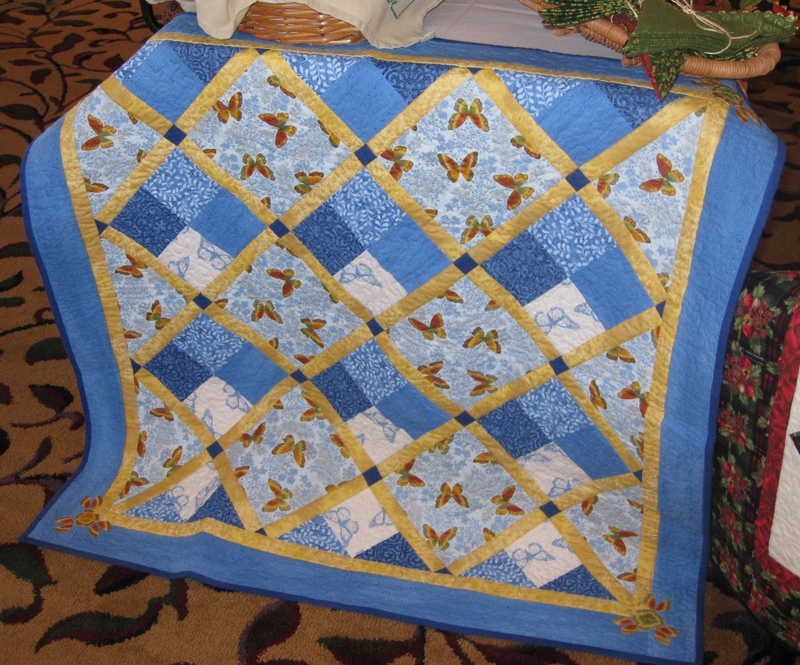 Love your quilts in the blog. Those points can be a bear sometimes! I started my first quilt in 1990 so I guess it is my 25th anniversary! Congratulations on your anniversary! Glad to hear you are still enjoying your blogging - I am! Congratulations! I started a couple of years ago and am hooked! I've been quilting for about 25 years! Google+ and bloglovin follower: Nicole Sender! Happy anniversary! Your quilts are lovely! I've been quilting for about 30 years. I follow your lovely blog via Bloglovin! Thanks for the anniversary fun! Happy Anniversary. I have been quilting well over 50 years. That is a very long time. Oh the changes I have seen. And I am following you on Feedly! Congrats on your wonderful journey. I took my first quilting class about 28 years ago. That quilt is not finished and probably never will be. I started machine piecing in 2003 when I was diagnosed with breast cancer. Six weeks later I was diagnosed with fibromyalgia. The loss of arm strength due to the cancer and the exhaustion due to the fibromyalgia certainly limit my quilting and I enjoy every minute I am able to piece. Thanks for the month of giveaways. I've been quilting for about 18 years. Happy 10th anniversary! I have been quilting for the last 3-4 years. I love the complicated and hand sew, so I have only finished 2 quilts. I have 2 WIPs and a few I want to start. Congratulations! You have really gone places in your 10 years. I have been quilting for about 13 years now. Trying to put a lot more time into it since I retired. Keep up the good work! P.S. I am a follower of your blog. Congrats on 10 years of quilting. I don't have pictures of my first quilts either. About 12 years now! Can't believe it has been so long! I should have more done. Congratulations on these milestones. Love your mini review. I have been following your growth right here on your blog. Thanks for the opportunity for participating in your giveaway. wow, congratulations :) I have been quilting for 3 years. My first quilt was when I was 23 years old... I had cut up my husbands old work shirts which were Burgandy, blues and whites... I just cut 5" squares, laid them out in a nice pattern and sewed them together.. hand tied.... now that I look back it was just awful... I have no clue where that quilt ended up and I didn't make another for many years.. thirty years later I am now making many quilts for my charity group, family and friends... and loving every minute.. shame my first one was such a flop but so glad I found my quilting love in later years. Congratulations on 10 years of quilting. I've been English paper piecing for 40 years but only 3 years for pieced blocks. I follow by GFC. Love your blog and your quilts. Congratulations on 10 years. I enjoy reading your blog. Congratulations! I've been machine sewing/quilting for 3.5 years. -Ever since my mom gave me a sewing machine that she picked up off the curb! Happy anniversary. I have been quilting for about 25 years and love it. I would love to win this thanks so much for the giveaway! I've been quilting for almost 7 years now. Isn't it cool to look back at those "firsts" and amaze yourself w/how you've developed your skill set. I have been quilting for 20 years...egad. Thanks for the giveaway! I have been quilting about 20 years now...just after my first child was born! And Congratulations on 10 years...that's a lot of quilting! Congratulations on your 10 yrs! I began learning to quilt about 5-6 yrs ago now I think. I learned most of what I know online from blogs and reading lots of books and websites.